Here on the blog we’ve been busy working on St. Patrick’s Day crafts and treats, which often means searching the web for inspiration from others. In today’s round up, we’ve found a pot of gold when it comes to craft ideas for this holiday. From shamrocks, to rainbows, there are a plethora of craft choices for any skill level. If you are looking for an idea to make for a St. Patrick’s day party, a gift or way to take treats to your kid’s classroom, or even some decor to place around the house, these St. Patrick’s Day crafts are among the best we’ve found. Please comment and let us know which ones you’ve made, or plan on making, for your St. Patrick’s Day events. Grab this free printable to put your St. Patrick’s Day snacks in for party time! Great way to hand out St. Patrick’s Day treats and use after! If you’re a crocheter, this would be the perfect gift for your coffee-loving friend for St. Patrick’s Day! The shamrock is a fairly simple pattern to follow for beginners. A cute craft using a terracotta pot, Mod Podge, glitter, paint and Rolos! This one would be great for a party centerpiece. These placecards are perfect for guests to take home! Plant the clover in tiny pots and cut shamrock shapes to write guest’s name on. This sign is perfect for St. Patrick’s Day decor! Paint the burlap using a stencil, and add a cute glitter shamrock! I love how the burlap makes this sign look a bit rustic. This fluffy shamrock would be perfect for the front door. Getting the feathers from the dollar store would make this a fairly inexpensive way to give your entry way that extra pop of color for the holiday. This very shiny craft is made using letters purchased at your local craft store, some copper paint, and pennies! The end result is gorgeous! Three pallet art designs all in a St. Patrick’s theme. This post features an ombre shamrock, an embroidery floss shamrock, and a luck chevron pallet. 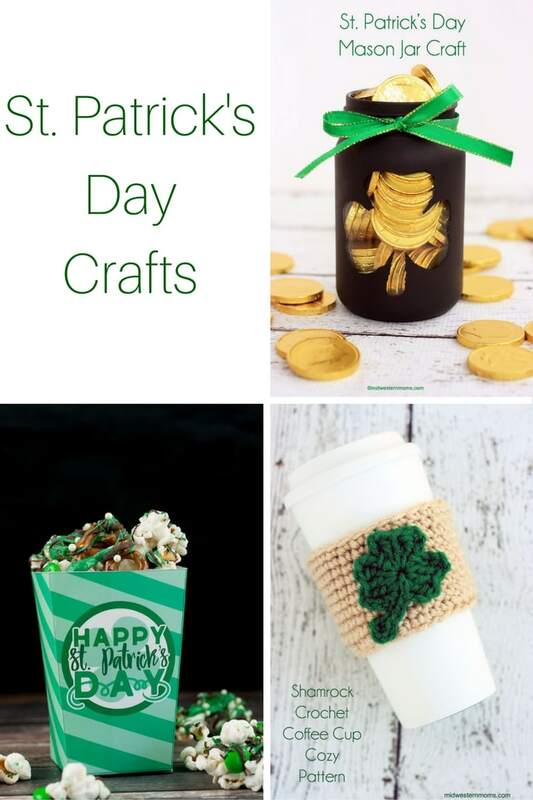 Easy and inexpensive ways to craft this St. Patrick’s Day! This DIY wreath is not only gorgeous, but a simple way to add some green to your decor this St. Patrick’s Day. In fact, this is a perfect spring wreath to keep hanging the entire season! I adore the contrast of this sign. White and green stripes with “lucky” stenciled in gold. The circular sign would make it a great addition to a gallery wall, mantel, or shelf for St. Patrick’s Day. Using a sewing machine and her die cut machine, this mom made some awesome treat bags for St. Patrick’s Day! These candy-filled jars feature bright rainbow colors leading to a pot of gold (rolos). Very cute and visual craft to use as decor, or a centerpiece. Just two rolls of ribbon and some wire is all it takes for this adorable craft to hang on your front door. Looks inexpensive and fun! A dainty crown using pipe cleaners, crepe paper, and floral wire and tape. What a great DIY idea for a party! A clever craft using floor cleaner and glitter to decorate a vase! I love this method, this is also how I get glitter to stick to glass ornaments. Paper banner for St. Patrick’s day that is all about the texture. I love how this would look against a mantel, or large shelf. I’m loving the look of these pillows, using heat transfer material and a die cutting machine. Great way to add a splash of green to your couch or chairs. Are you feeling crafty for St. Patrick’s Day? Which craft are you most excited to make?